Three months ago, I started a crowdfunding campaign… for myself. I won't go into details now, but if you’re interested in my crowdfunding project you can read all about it here. What I do want to talk to you about today, is what I have promised my funders as a thank you gift. In return for their investment, I want to make them a set of handcrafted greeting cards. So the past weeks, I have been busy with collecting old envelopes and scratch paper, mixing it with water, then sieve it through a fine mesh in order to turn them into a new beautiful piece of paper that is ready for reuse! I am happy that even though I have no money, I can still do something back for all these generous people by taking my creative skills out of the closet again. The last year, I have been doing so much research around eating clean and detoxing, that I have forgot a little about my old passions: handcrafting, creative writing and photography. Feels good to pick it up again. It makes me feel calm, and in this case, it feels good to do something back for other people, even though it’s just a little gesture. I searched a long time for a lab that does clinical screenings in Belgium. I finally found one in Holland: RP Sanitas Humanas. 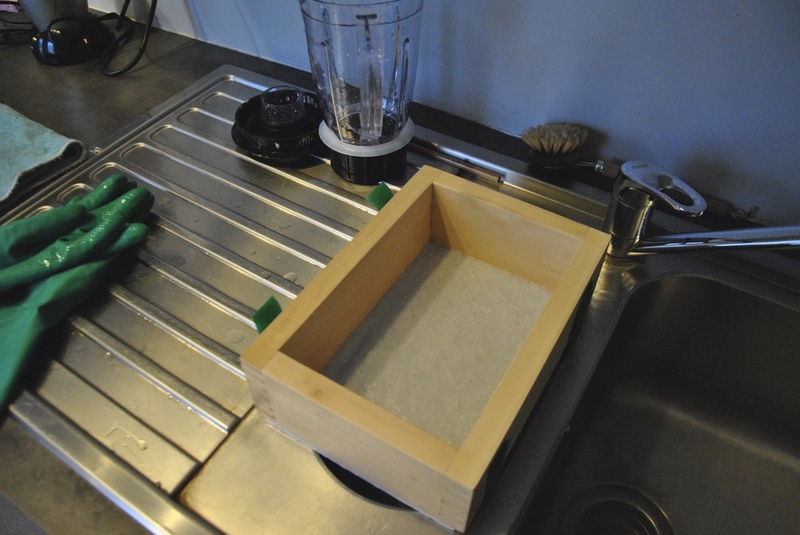 I bought my paper making kit from Paper Alice. If you would like to order a set of eco paper cards, contact me on Facebook or send me an e-mail! You can find my e-mail address at the bottom of this page.